Due to a bit of a mix up on our part, we found that we had longer to hang about after Bicorp than we thought. We’d arranged to go and visit a friend at Finca Slow, a permaculture/regenerative olive farming operation, but somehow we’d got it into our heads that it was much further away from us, close to the French border. In fact, it is not far from Tarragona, south of Barcelona and only a couple of hour’s drive away. When it dawned on us (hanging about doing very little on the coast at that point) that we actually had about five days to kill, we were forced to do a bit of a re-think. In our usual haphazard manner, we looked at the book, and just picked a couple of places in the area to stop at. 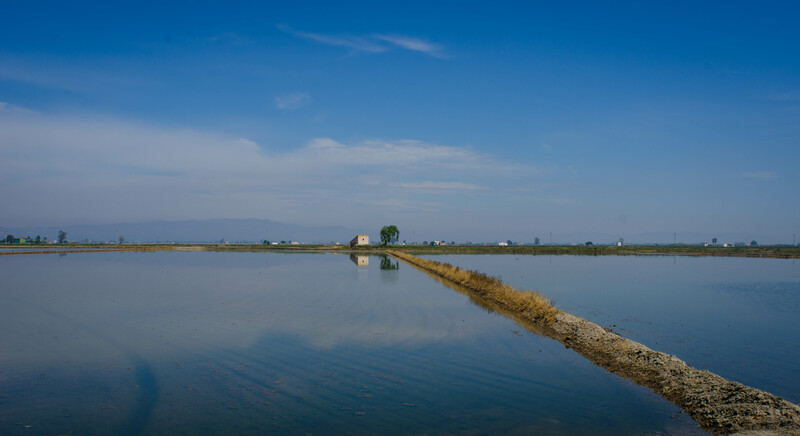 One of these places turned out to be the remarkable Ebro Delta. 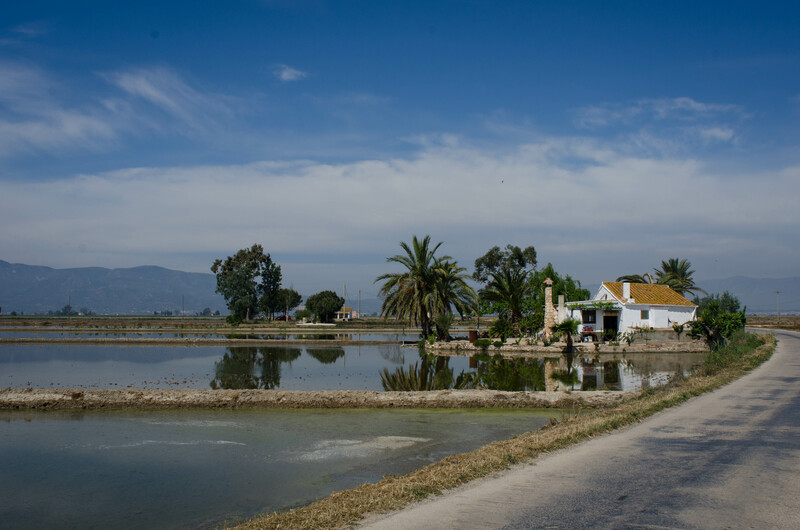 Allowing the sat nav to guide us, not really knowing where we were headed, we turned off the main road and were soon driving narrow tracks between shimmering sky mirrors, with egrets and purple herons rising from the edges of the road as we passed. 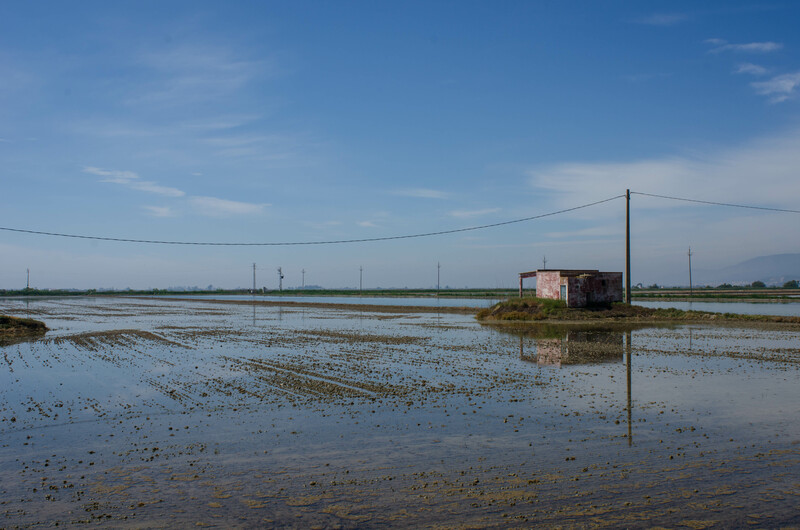 These bright water fields reminded me with a pang of the paddy fields of South East Asia and we realised that we might have stumbled across something quite special. 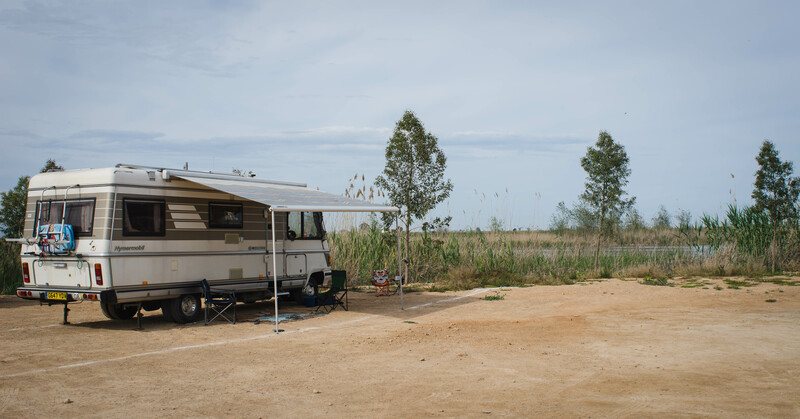 This was confirmed as we pulled into the very well equipped camper stop and saw that there was a visitor centre, bar, popular restaurant and lots of general family entertainment. 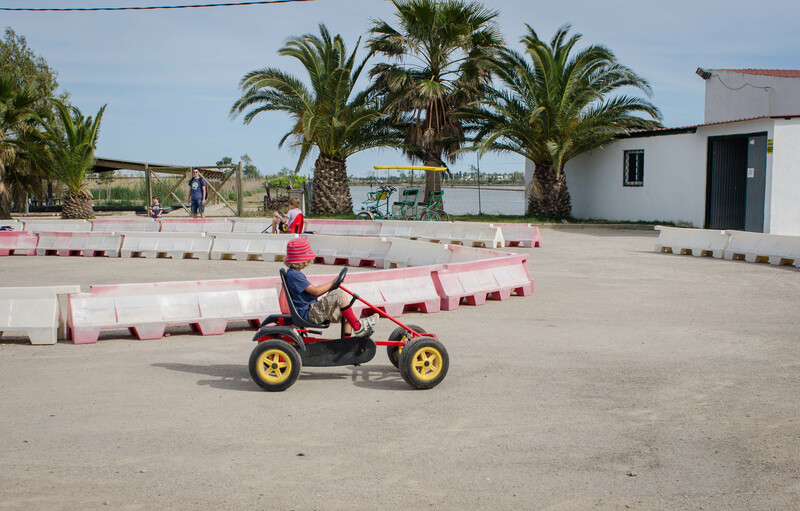 It was a holiday weekend, and through the rest of that evening and the following couple of days, people flooded into the centre to cycle, eat, play, walk and watch the incredibly diverse birdlife. 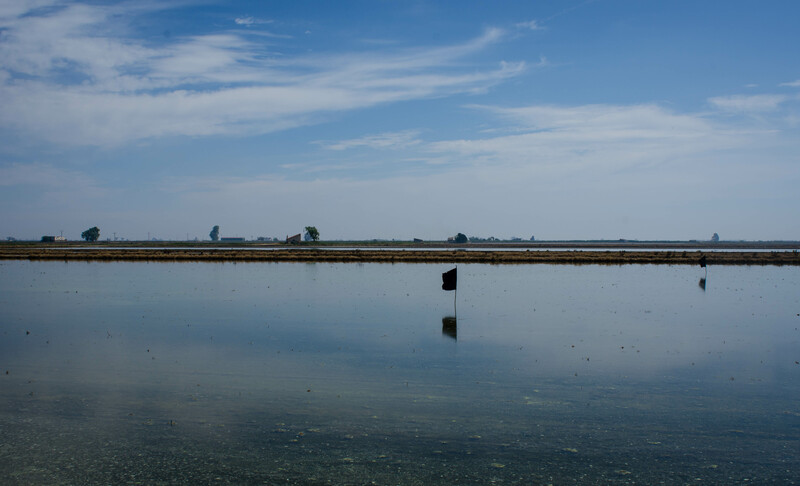 It turned out that the delta is one of the most important wetland areas of the Mediterranean with over 300 different species of bird having been spotted here. The mixing of salt and fresh waters ,as sea meets river, creates a rich and diverse range of habitats which in turn allows the wildlife to flourish. Bird watchers were everywhere, one of whom lifted up the boys to see the black-winged stilts we’d been identifying with our huge bird book (thanks again Uncle Richard!) and another shared with us his prize photo of the day, a collared pratincole. With the help of our increasingly well thumbed book we identified the apparently rare purple Gallinule and saw plenty more egrets, herons and flamingoes during our stay. 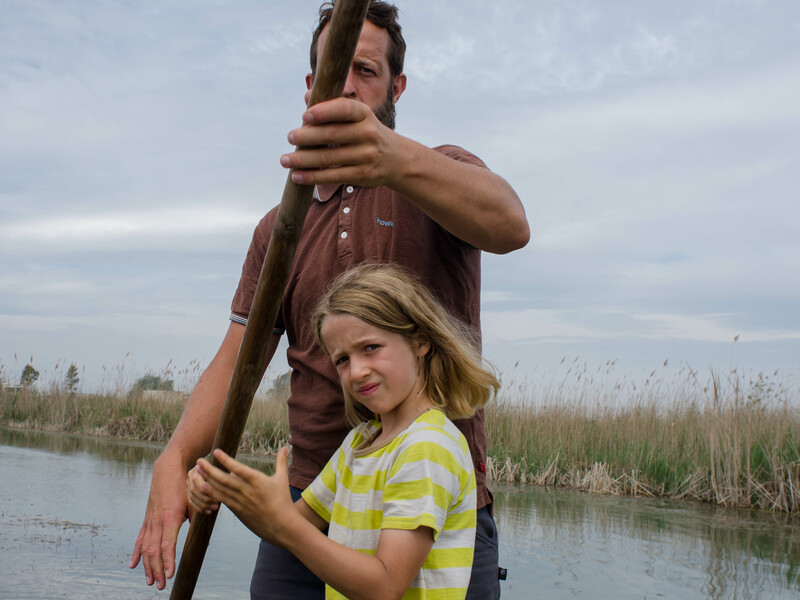 Apart from the twitchers, families and gastronomes were flocking to the delta that weekend too and along with all the holidaymakers we cycled, punted and ate seafood-laden paellas. 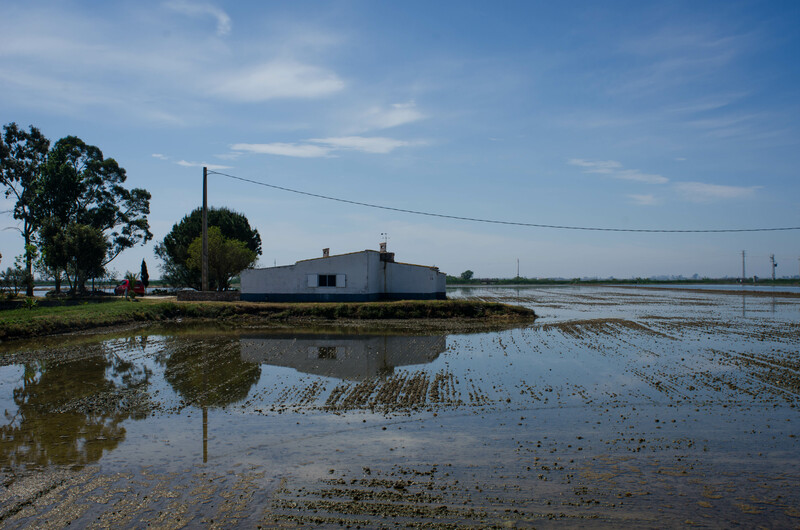 There’s a visitor centre, a museum and plenty of goodies for sale, including the special delta rice, wine and mistela. There was such a wealth of nature and fun to be enjoyed that we couldn’t believe our luck! Yet again the gods and patron saints of hapless travellers had taken pity on our wandering souls and thrown us yet another jackpot. Planning is fine, but nothing beats the joy of stumbling across somewhere marvellous, quite by chance. Ah, so glad you liked Norma! I keep meaning to share more music but failing! Have you got any favourites to share with us?